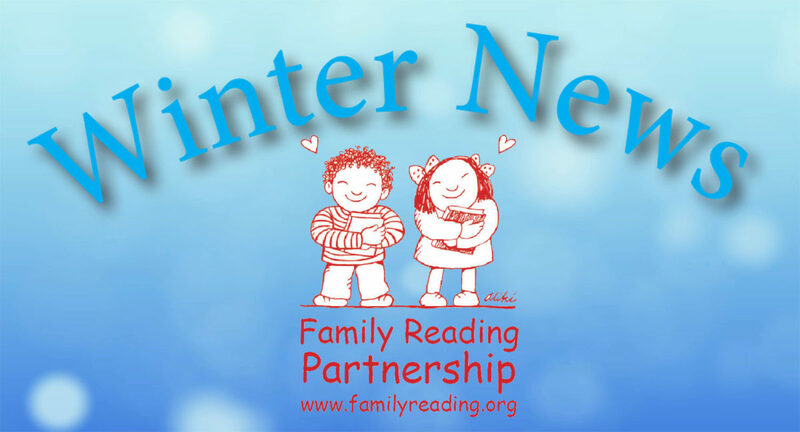 Earlier this winter Family Reading Partnership was awarded a United Way of Tompkins County Youth and Philanthropy grant to install two new story walks in the area, one at the Enfield Elementary School and one in the Village of Dryden! We are eagerly awaiting the thaw so that we can get to work on building these wonderful community resources. Caroline Cope and her granddaughter picked up a copy of "It Began with a Song" during the Danby Harvest Festival! 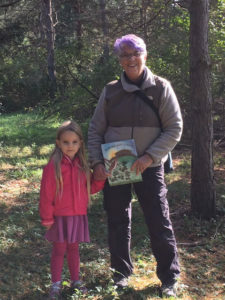 Story walks are a joyful and physically active way for families to engage with books, get outside, and just have a fun time talking, playing, and reading together. A children’s picture book is placed, one laminated page at a time, on staggered metal fence posts along a ½ mile path, at a height where young children can see and touch the pages. Bright red arrows are placed on the stakes leading the way from one post to the next, creating a fun scavenger hunt for the whole family! We build our story walks in such a way that the book can be changed out often, so that families can have a new experience when they return. In each community FRP will host a launch event where families will receive a free copy of the first book and be invited to go on a guided read-aloud journey through the story walk. We will let you know when these events will be taking place and hope to see you there! Thanks to funding from the Ithaca Rotary Club and partnership with the Danby Community Parks Association, FRP installed our first story walk of this type last fall at Dotson Park in the village of Danby. The walk in Danby is particularly lovely, as it changes forest environments several times--adding really neat drama to the experience. This walk will undergo improvements and get a new story in a few months, we hope you will go visit! Help us win $5,000 in The Solomon Organization/Ithaca Apartment Management’s Give A Chance Charitable Lottery! It’s easy: vote for Family Reading Partnership once a day for the entire month of February at the Solomon Organization/Ithaca Apartment Management Facebook page: www.facebook.com/IthacaApartments/ That’s it! For over a dozen years the Family Reading Partnership has been distributing books to all families who visit a pediatrician in Tompkins County through our Books to Grow On program. As a part of this program, with support from Wegman’s and Tompkins Trust Company and in partnership with the Tompkins County Public Library, a “Welcome Baby” bag is given away to all families who give birth at Cayuga Medical Center’s Birthplace. 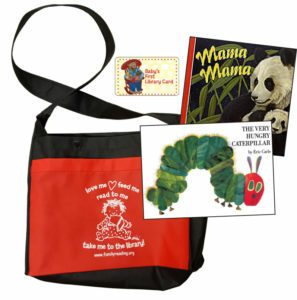 In the bag families receive: a copy of the Eric Carle classic “The Very Hungry Caterpillar,” Baby’s First Library Card, and resources encouraging new parents to “Talk, Read, Sing, Play” with their infants every day. In 2018 we heard from local pediatrician’s offices that some families were arriving at their practices with newborns who had not received this “Welcome Baby” package. For a variety of reasons, their baby was not born at the Birthplace; high-risk pregnancies and premature births, foster care and adoptive families, relocation to Tompkins County, and those who had home births. We have now made the collection of resources available to all of the pediatric offices in Tompkins County, so that they can give them away to families who did not receive them at birth. We want to empower ALL families in Tompkins County to playfully engage with their young children, and we are finding new ways to do that every day! You may have heard through the grapevine that we are winding down the distribution of our Love Those Letters program. Thousands of children in the Ithaca City School District have grown up with this familiar letter-learning program in recent years, and we are so happy to have been able to provide this resource to teachers and parents alike. As we shift our programming focus back to supporting families of infants and young children and creating new and innovative ways to reach all families with impactful and responsive programs, we are ready to say goodbye to Love Those Letters. Family Reading Partnership offers our thanks to the many co-creators of Love Those Letters: Carol Cedarholm, Katrina Morse, Greg McQuade, Lisa Tsetse, the Alphabet Kids, Photosynthesis Productions, and Cal Walker. We have some really exciting news up our sleeves, so stay tuned this spring! Come see us Saturday, February 9th at the Ithaca Children’s Garden’s annual Fire & Ice Festival! We will have a read-aloud story circle under the story tree from 3-4pm. Bundle up and celebrate all that Ithaca winter has to offer!